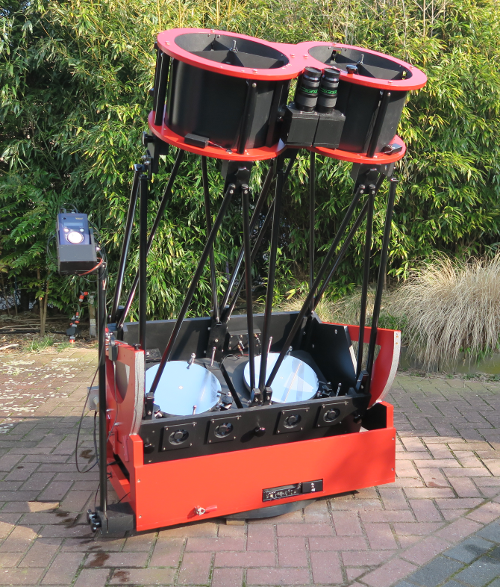 This particular binoscope is is made around 2 x 18 inch mirrors, made by Mike Lockwood. Another one, also made around 2 x 18 inch mirrors. 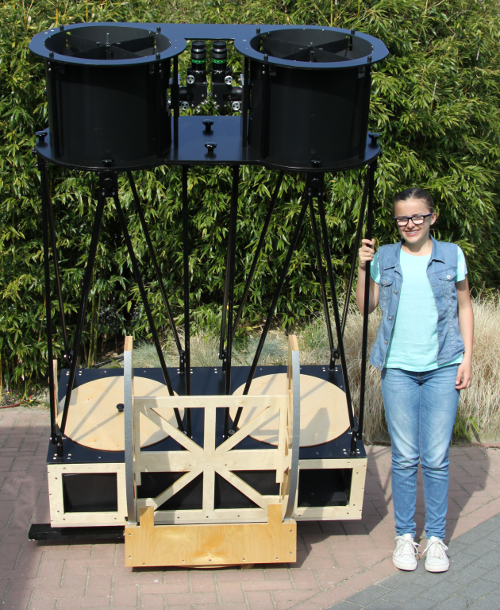 Although growing up fast, such large binoscopes dwarf my daughter! 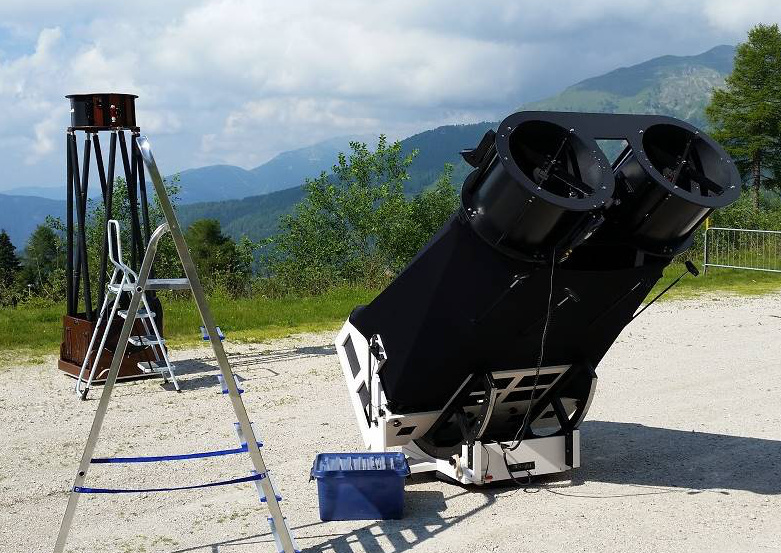 This is another example of a 2 x 18 inch binoscope, photographed at a starpary in the Italian Alps. The owner is Peter Vercauteren and it harbors two 18 inch mirrors, made by John Nichols. One observer told Peter "that the binodobson had surpassed by far his wildest expectations". (Cited from Cloudy Nights). My first binoscope harbored two 2 x 13 inch f/5.0 mirrors made by Mike Lockwood . This binoscope convinched me of the advantages of observing with a binoscope. The optics are very impressive with pinpoint sharp stars throughout the entire field. The increased contrast, the enlarged field of view and the sheer comfort of looking with two eyes are also very obvious. 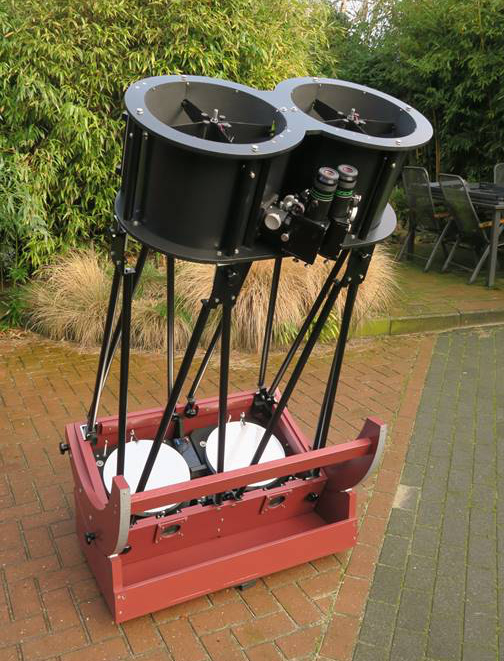 Also with 2 x 13 inch Mike Lockwood optics, this is a binoscope I delivered to Alexandre Jeser who stated: "I think it is the instrument I dreamed of all my life". And another 2 x 13 inch binoscope, equiped with ServoCat and Argo Navis. At the other end of the spectrum, here is an example that is made around two identical 8 inch f/6.0 mirrors made by Jan van Gastel (Jan van Gastel Mirrors). With two 8 inch mirrors this comes close to the equivalent of single 12 inch mirror. The use of a binoscope involves more complex features such as the need to merge the images. One way to achieve that is by very slightly moving the primary mirrors in relation to each other. This can be done by simply turning the long aluminum rods that are attached to the mirror cells. See for elaborate explanations and discussion the Article Merging of the Images. Also, since different observers have different distances between their eyes, a binoscope must have a mechanism to change this so-called interpupillary distance (IPD). Principally, two solutions are available. One is to use two sets of focusers, and the other is to construct so-called tunable tops. With tunable tops one or two upper secondary mirror cages are rotated around their axis. The advantage is that the length of the lightpath does not change, so no re-focusing is required when different people use the binoscope. However, there often remains some residual slop in the system, which easily results in separation of the images. I found this last aspect more negative than just some re-focusing. After extensive use of both approaches I prefer and use the four-focuser solution. Here, two sets of focusers are shown. Here one focuser changes the distance between the tertiary and secondary mirror, thereby increasing or reducing the IPD. Since the length of the lightpath changes a bit, a second focuser is needed between the tertiary mirror and the eyepiece for re-focusing. The advantage of this approach is that it allows a very rigid and stable upper structure of the binoscope. Also, the possibility to rotate the tertiary mirror set-up slightly in the focuser, allows to eliminate residual field rotation in the image.